The IDF, police and Shin Bet arrested a Palestinian from Hebron in a raid of El-Bireh near Ramallah Friday night, Feb. 8. 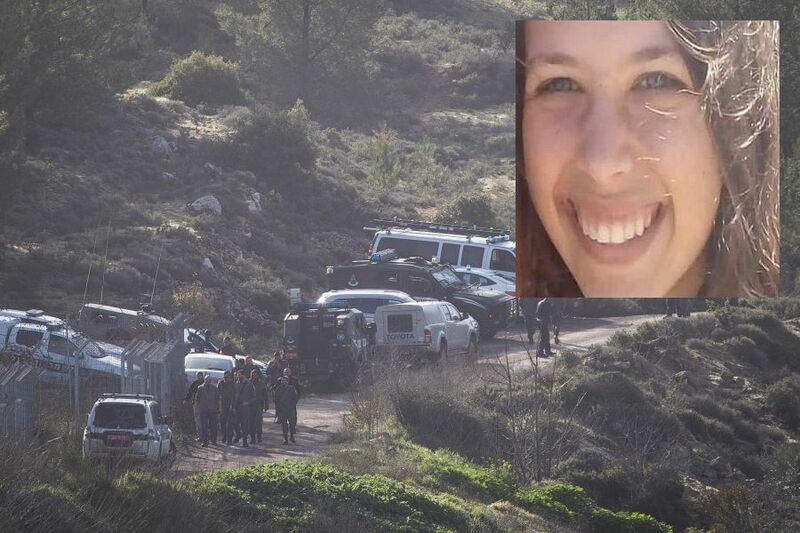 He is one of the suspects in the assault and murder of Ori Ansbach, aged 19, from Tekoa, whose body was found with marks of extreme violence in the Ein Yael Forest near the Biblical Zoo in Jerusalem. The suspect was tied to the murder atrocity by forensic evidence that was collected at the crime scene in the forest. The hunt continues for additional suspects. The forces arresting the wanted Palestinian near a mosque were attacked by a crowd, which hurled home-made bombs, rocks and iron bars at the forces and blocked their path. Some witnesses reported gunshots at the officers. There were no casualties. The court gag order prohibiting the release of details of the investigation is still in force. The murder is known to have been carried out by a group. The investigators expect the first arrest to lead to the rest of the gang. The Shin Bet and police is under extreme pressure to solve the crime with all possible speed, not only because of its gravity, but for its symbolic effect. The murder of a young Israeli woman serving in the national service program in a populated area of southern Jerusalem has the dangerous potential of inspiring Palestinian extremists to perpetrate more terrorist acts of the same kind. Ori Ansbacher was found just three weeks after an elderly Israeli couple, Tamar and Yehuda Kadouri, were murdered by a Palestinian man at their home in another part of Jerusalem, Armon Hanatziv. The police have so far not run down the perpetrator. It was therefore doubly important to quickly solve the murder of Ori Ansbacher, who was laid to rest on Friday at Tekoa. The police and Shin Bet have assigned their most effective investigators and special resources to the case for a fast resolution. torture the criminal arab Muslim scum murderer. then shoot him in the head. And the killer is being released next week I guess ? Israel for its own sake must act differently and put this scum + those who sent them ! to the gallow ! You know exactly who they are and where they live! But as Ori os not the PMs daughter, it will be like with Shalit : The government will do NOTHING and the muslim scum will laugh their heads off…. The Killerstinian youth are taught to hate and murder. The groups, NGOs, and individuals determined to demonize Israel ignore the terrorism and antisemitism that is drilled into Muslim youth; making them into wild murderers and thus never any chance to live together in peace. They are here in 2019 but their minds are in Mohd’s 7th century and still in conquer and kill mode. This should not happend. I’m in tears and full of anger. People wonder why there is no peace?! There is no peace possible with such hateful murderers. Ori did not harm any one. She was innocent. May Hashem avenge her blood. NOT OK – In 2010, a public square in El-Bireh was dedicated to the memory of Dalal Mughrabi, leader of an attack that killed 38 Israeli civilians, including 13 children, in 1978. NOT OK – On Feb. 8 2019 the forces arresting the wanted Palestinian near a mosque were attacked by a crowd, which hurled home-made bombs, rocks and iron bars. NOT OK – Feb. 9 2019, full 24 hours after these events commanded by Hamas, the city is still standing and there is no deportation. There is no obligation for Israel to unilaterally respect the Oslo Accords. Which is the only country in the world where the murderer of an innocent jewish teenager is rewarded with wealth and fame? Right .. Israel. The terrorist and his entire family should be killed Measure for measure. The rotten apples do not fall far from the tree! It’s better for a country its ceased to exist than its doughter to be killed like this way. Its better to die like a lion for your honor than to live in fear like day and night like a sheep becouse after all she was your sister your honor . Not only they killed one Israeli but many becouse also her future childeren and childeren of her childeren thats way they choose her. So Israel stand up trust your God fear no one except Him like he commanded you! It’s better to die than to live in this shame or to be killed one by one, yesterday our sister tomorrow our mother and the day after whose next? When will we be wise when they come in the darkness of the night to pull us from our car to kill or knock our door to bring us to kill like nazis did? Of course the individuals that committed this act must be punished to the extreme. But I think that this is not enough. Without diminishing their personal responsibility, I want to remind everyone of the politicians, journalists, parents, and school teachers that are responsible for what is in the brain of these individuals. “Politicians” and “journalists”, incidentally, also includes some extremist elements in Israel. These must also be dealt with. They also carry responsibility for the tragic death of this victim, and others.